Who doesn’t love completing surveys. I for one enjoy them, or least I did, until I began to get so many, that I decided to save precious time by deleting or tossing them. I crossed that bridge when I found out that some surveys worked against me. By completing a survey from my auto insurance company, and indicating I was a very happy customer, I was placed in a group with less opportunity of getting a better insurance rate. Why? Because I was happy; there was less chance of me leaving for another auto insurance company. Watchdog decided to do a survey and rather than investing a lot of time on it, I decided to survey one person whom I could trust to give honest answers, myself. I horizontally listed all nine council members in alpha order, and then rated each one from 1 to 10 vertically, with ‘1’ being equal to an empty seat, and ’10’ being “getting it right” most of the time. Of course ‘getting it right’ was based on my definition of ‘getting it right’, which likely is different than your definition, but in the spirit of keeping the survey simple, my definition seemed appropriate. 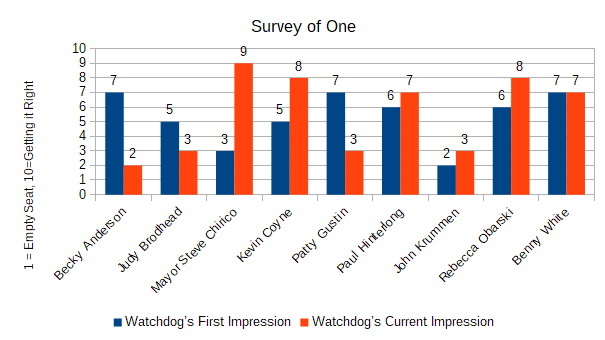 Additionally to add some pizzazz to the numbers Watchdog listed each council member from Watchdog’s first impression of that person’s contributions to council meetings, to Watchdog’s current impression of each. In other words, has Watchdog been open-minded about each council member’s contributions over a period of time; have they gotten better or worse over time. Finally, considering it would be rude to rate a council member’s contribution equal to an empty chair, Watchdog refrained from a rating of ‘1″. Likewise, considering a ’10’ rating means there is no room from improvement (which there always is), a ’10’ was there only for reference. Becky Anderson went from 7 down to. 2. Many of her decisions and positions are based on what’s best for Anderson. Her rating fell drastically when she took the position of wanting Naperville to be a ‘Welcoming city’ (sanctuary city). She lost Watchdog with that one. Judy Brodhead went from 5 down to 3. She adds very little if anything interesting to meetings and seldom if ever, takes a strong position on any topic, while playing it safe, and nearly always votes with the majority. Mayor Steve Chirico went up from 3 to 9. When Chirico was first elected as a council member, Watchdog was very critical of some of his comments. He owned-up to his mis-steps in the very beginning (which most elected officials don’t do) and has become an absolutely outstanding leader for Naperville. Kevin Coyne went from 5 to 8. Initially losing his first attempt running for election by just a few votes, he tried again and was elected. His somewhat quiet demeanor should not be mis-interpreted. When he speaks, people listen; he doesn’t waste words. He can say more with fewer words, than anybody at the dais. Patty Gustin went from 7 down to 3. Simply stated, Gustin as been a disappointment. Too much talk, and not enough originality. It’s taken nine years to move up one number, which means it could take another 18 years for him to move from 7 to 9. He does add a little humor to meetings and asks some interesting questions. Overall, a good member on the council. John Krummen moved up from 2 to 3. But 3 is a long way from 5 which is average. He entered the council as a 2 because of his position and performance as an “ambassador” for the hotly divided debate on Smart Meters. It’s difficult to erase the image of him constantly looking over his shoulder at the podium during Smart Meter debates as if someone was about to dump a pail of water on his head. Rebecca Obarski went from 6 to 8. The last thing we needed on the council was another lawyer, but she came to the dais knowing she had a bit to learn, and has become an outstanding member of the council to the point that after Chirico finishes his term limit as mayor, she would be a strong candidate. Benny White entered as a 7 and remains a 7. He is a valuable member of the council with an appealing style of communication. He limits his comments, which makes what he has to say important. Overall the council averaged a 5.6 with 5 being average. Definitely room for improvement at election time, however as an overall city council, they are getting the job done making Naperville a good place to be as a resident. Sometimes if you have something important to say, all you have to do is find an open door, with a bunch of people sitting at a meeting, an available microphone, and three minutes to make your point. That’s exactly what Lisa Ann Witmer Wegman did during public forum at a recent Davenport, Iowa Zoning Commission meeting when the topic at hand was Portillo’s coming to town. Once at the open microphone, it didn’t take her long to get to the meat of what was on her mind. Watch and listen as she begins firing away. Pay close attention to the seasoned gentleman seated behind her as he does a hand-to-the-forehead five times, a nose-touch twice, and a hand-to-the-chin three times during the three minute rant; that’s one exasperation every 18 seconds as he undoubtedly is wondering what in the world is going on. You have to give credit to the chairman of the commission for listening and then getting the focus of the meeting back on track. It sounds as if Lisa Ann Witmer Wegman has a lot going against her, but if she can stay in Iowa long enough before moving to Texas, she will be able to enjoy one of Portillo’s finest hot dogs. And what’s the deal with losing her password at the local library. Who knows, she just might pop up at the local library board meeting with an open mic waiting. It could be worse, she could be having a problem with the town’s water department. It’s July 4th weekend and there is no shortage of local issues to look at, however even the Naperville city council decided to cancel the July 3rd meeting in lieu of something other than local issues. Why shouldn’t Watchdog do the same thing. What could better than talking about baseball, especially at the 8 to 10 year old level which happens to be the age of my two baseball-playing grandsons. If you haven’t had the opportunity to read Rob Manker’s article in the Friday July 6th edition of the Naperville Sun titled “Lessons on field can give winning, losing perspective“, I encourage you to do so. It’s not your typical article about organized youth baseball, with crying kids, idiot parents, and Mike Ditka-like wanna-be coaches, along with bad sportsmanship, and over emphasis on winning at all costs. It’s about what should be important at that age and keeping things in perspective. St. Louis Cardinal manager Mike Matheny, wrote the book “The Matheny Manifesto” (2015) which is a great read especially for any parent or youth coach. In it he explains why he said he would only coach a team of orphans. It’s not because he doesn’t love baseball or kids, it’s because he didn’t want to deal with ‘idiot’ parents; they take the fun out of the game and add unnecessary pressure to the kids. He was raised old-school in a small mid-west town, taught to do the right thing, not to take short-cuts, and to be selfless, humble, appreciative, respectful and disciplined. Teach the boys how to play baseball the right way. Nothing about winning, individual statistics or awards. Just simply doing it the right way. The book gives outstanding perspective of what’s important. I know this because I am the proud dad of a coach and proud grand-dad to two players. Politicians and city officials are typically not known for keeping a watchful eye on expenses, since it’s so easy to get more money by squeezing it out of residents with higher taxes and fees, in essence easy come, easy go. Spending other peoples’ money comes easy. However Naperville councilman John Krummen has been a leader on the council when it comes to employing sound business practices on issues involving money. All too often little attention is given by city officials to ‘what if Plan-A doesn’t work’. In the business world, contingent plans are vital to successful outcomes. It’s been said that typically Plan-B’s are more successful than Plan-A’s, but if there is no Plan-B, that’s not good. So kudos to Krummen for addressing the need for contingent plans, “having discussions now, rather than later”. Krummen followed with another expense related topic regarding the traffic light to be installed 95th Street and Knoch Knolls road. Watch and listen as he questions Bill Novack, Director of TED (Transportation, Engineering, and Development) concerning the $300,000 expense for the light, especially as it relates to the struggle that the city council had in trying to deal with $300,000 in budget cost savings. Krummen didn’t settle with Novack’s answer, coming back at him with the possibility of ‘bargaining harder’ for a better deal with Will County. Is it possible that councilman Krummen did something that Novack hasn’t done, and that’s reading President Trump’s book, ‘The Art of The Deal’.